Aims To determine the influence of prostaglandin analogues (PGAs) on corneal biomechanical properties in patients undergoing chronic treatment for primary open-angle glaucoma (POAG). Methods Prospective, interventional case–control study. 70 eyes from 35 patients with POAG on chronic PGA therapy were recruited. One eye per patient underwent PGA cessation for 6 weeks while the contralateral eye continued to receive the treatment. Corneal hysteresis (CH), corneal resistance factor (CRF), corneal-compensated intraocular pressure (IOP) (IOPcc), central corneal thickness (CCT) and Goldmann tonometry (Haag-Streit AG, Koeniz, Switzerland) IOP (IOPGAT) were measured at baseline (visit 1), 6 weeks after PGA cessation (visit 2) and 6 weeks after PGAs reinitiation (visit 3) and were analysed using a linear mixed-effect model. The discrepancy between IOPcc and IOPGAT was defined as IOP bias (IOPcc—IOPGAT). Results Baseline characteristics were comparable between the two groups. In the study eyes, significant increases (p<0.0001) were detected at visit 2 in CH (9.0±1.8 vs 10.3±1.7 mm Hg), CRF (10.5±2.1 vs 11.7±2.1 mm Hg), CCT (541.8±43.2 vs 551.9±41.9 μm) and IOPGAT (15.4±3.0 vs 18.4±3.8 mm Hg). IOP bias in this group was significantly lowered at visit 2 (p<0.0001). These effects were reversed at visit 3. The control eyes did not demonstrate any significant changes over the study period. Conclusion Topical PGAs induce reversible reduction in CH, CRF and CCT in patients with POAG. These changes contribute to underestimation of the IOP measured by Goldmann applanation tonometry and warrant caution when assessing response to treatment. Trial registration number NCT02388360, Results. Affecting approximately 67 million people worldwide, glaucoma is the second-leading cause globally for avoidable blindness.1 Intraocular pressure (IOP) remains the most important modifiable risk factor and is the sole target for the currently proven glaucoma therapies. The accuracy of its measurement therefore carries significant clinical impact. The Ocular Response Analyzer (ORA; Reichert, New York, USA), a non-touch tonometer, uses a rapid air jet to temporarily deform the corneal surface. It provides IOP readings adjusted for corneal biomechanics, as well as quantifiable viscoelastic parameters, including corneal hysteresis (CH) and corneal resistance factor (CRF).5 For glaucoma management, CH is of special interest. A low CH has been associated with advanced glaucoma damage6 and with glaucoma progression.4 Moreover, several studies demonstrated recovery of CH following surgical7 or medical8–10 glaucoma treatment. The objective of our study was to determine the effect of chronic use of topical prostaglandin analogues (PGAs) on corneal biomechanical properties in eyes with POAG. This research protocol adhered to the Declaration of Helsinki and was approved by the Maisonneuve-Rosemont Hospital Institutional Review Board (Montreal, Quebec, Canada; ClinicalTrials.gov no. NCT02833860). Informed consent was obtained from all participants. Visit 2 took place 6 weeks after the PGA cessation. PGAs were then restarted in the study eyes and all eyes were reassessed after another 6 weeks, at visit 3. All serial measurements were performed by the same trained, unmasked observer (RM), with the same rigorous approach, using the same calibrated equipment and at the same time of day for each patient. Goldmann applanation tonometry (Haag-Streit AG, Koeniz, Switzerland) was used to record conventional IOP (IOPGAT) and the ORA was used to generate the corneal-compensated IOP (IOPcc).5 Similar to CH and CRF, the average value of four sequential measurements was recorded. The difference between IOPcc and IOPGAT was calculated for each eye and was termed IOP bias (IOP bias=IOPcc—IOPGAT). A positive bias value indicated an underestimation by Goldmann applanation tonometry in comparison with the ORA, whereas a negative IOP bias value suggested an overestimation by the former. The average of three CCT measurements, determined by ultrasound pachymetry (DGH Technology, Exton, Pennsylvania, USA), was recorded. Statistical analyses were performed using R (V.3.1.0). Continuous data were presented as mean±SE. Baseline quantitative data were compared between matched study and control eyes using paired t test. The null hypotheses of the impact of discontinuing PGAs on corneal biomechanical properties, IOP and IOP bias were examined using a linear mixed-effect model. Random effects were defined on two levels: (1) the patient and (2) the eye for each patient. Age was included in the model as a covariate. Contrasts between the eyes and times were estimated using adjusted p values to control for family-wise error rate. The associations between glaucomatous damage and corneal biomechanical properties were also examined using a linear mixed-effect model adjusted for the patient random effect. Thirty-five patients (16 men and 19 women; 70 eyes) with POAG were recruited. The mean age was 69.0±1.6 years (50–85 years) and the mean spherical equivalent was −0.10±0.46 D (−6.00 to 4.25 D). At the time of enrolment, patients had been on PGAs for 3.99±0.28 years (1–7 years). The topical PGAs used included bimatoprost (Lumigan RC, Allergan Markham, Ontario, Canada) (8 patients), latanoprost (Xalatan, Pfizer Canada Kirkland, Quebec, Canada) (15 patients)/(APO Latanoprost, Apotex, Macquarie Park, New South Wales, Australia) (1 patient) and travoprost (Travatan Z, Alcon Canada Mississauga, Ontario, Canada) (11 patients). All tested eyes underwent significant increases in CH (figure 1A), CRF (figure 1B), CCT (figure 1C) and IOPGAT (figure 1D) 6 weeks after PGA cessation (visit 2 vs visit 1; p<0.00001). In all cases, subsequently restarting PGAs induced changes of similar magnitude in the opposite direction (visit 3 vs visit 2; p<0.00001). While there were no significant differences between the two groups at visits 1 and 3 (p>0.05), all four parameters were significantly higher in the study eyes compared with controls at visit 2 (p<0.001). No significant changes were detected among control eyes during the study period for these four parameters. Evolution of corneal biomechanics and Goldmann intraocular pressure (IOP) in control and study eyes is shown. (A) Corneal hysteresis; (B) corneal resistance factor; (C) central corneal thickness; (D) Goldmann IOP and (E) IOP bias are shown. IOP bias=corneal-compensated IOP (IOPcc)—Goldmann IOP (IOPGAT). Means and SEs are represented. IOP bias baseline values were similar in both groups (table 1). A decrease in IOP bias values was detected in study eyes at visit 2 (p<0.0001), subsequently followed by a marginally significant increase (p=0.0553) after reinitiation of PGAs at visit 3 (figure 1E). Discontinuation of PGAs reduced underestimation of IOP by a mean of 3.2±0.6 mm Hg, the mean difference between IOPcc and IOPGAT decreasing to −1.2 mm Hg at visit 2. No significant change in IOP bias was detected among control eyes during the study period. Analysis of the interaction between IOP bias, CH and CCT revealed the following: a moderate negative correlation was observed between IOP bias and CH (r=−0.4979, p<0.0001; figure 2A), whether the eyes were on PGAs (r=−0.4736, p=0.0041) or not (r=−0.5058, p<0.0001). A moderate positive correlation was also observed between CH and CCT (r=0.4432, p<0.0001; figure 2B). 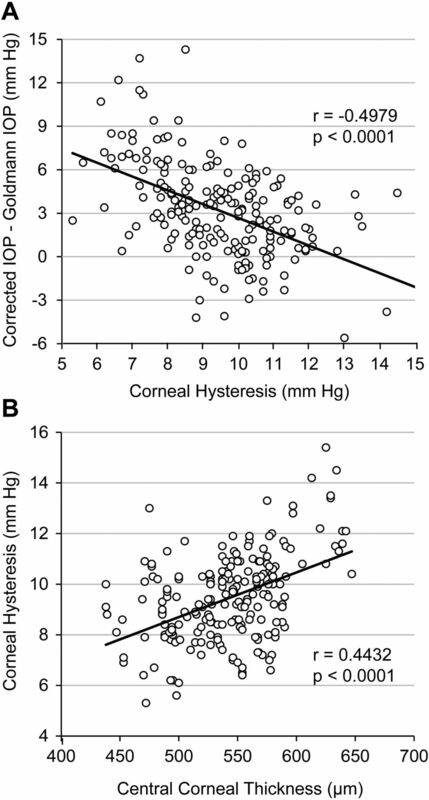 (A) Relationship between corneal hysteresis and intraocular pressure (IOP) bias. 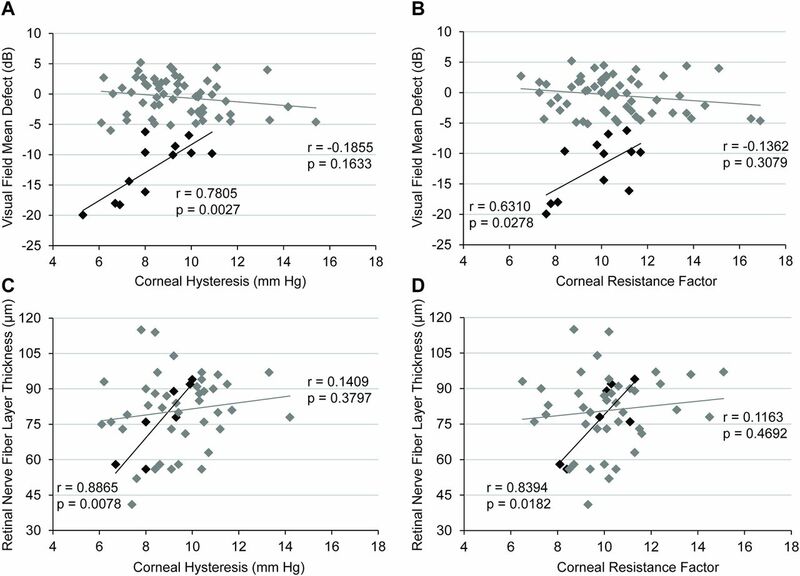 (B) Relationship between central corneal thickness and corneal hysteresis. IOPbias (IOP bias)=corneal-compensated IOP (IOPcc)—Goldmann IOP (IOPGAT). Regression lines are shown, along with correlation coefficients r and p values. We also examined our cohort of patients for associations between corneal biomechanical properties (CH and CRF) and indices of glaucoma severity (MD on baseline Humphrey VF and RNFL thickness on OCT). Five eyes from the study group and seven eyes from the control group were classified as having moderate glaucoma. All other eyes were classified as having mild glaucoma. 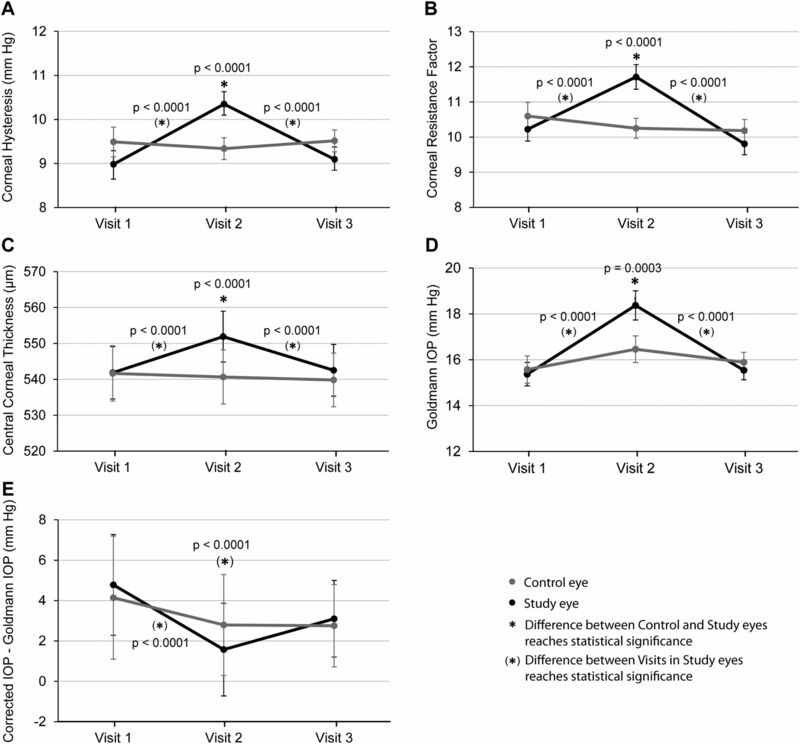 Statistically significant positive correlations were found between MD and CH (figure 3A), MD and CRF (figure 3B), RNFL thickness and CH (figure 3C) and RNFL and CRF (figure 3D) in the subgroup with moderate glaucoma. No similar tendencies were observed in eyes diagnosed with mild glaucoma. Correlations between Humphrey visual field damage at baseline and (A). Corneal Hysteresis and (B). Corneal Resistance Factor, in subgroups of patients with mild (grey squares) and moderate (black squares) primary open-angle glaucoma. Regression lines are shown, along with correlation coefficients r and p values. We herein demonstrated that the cessation of chronic topical PGAs was associated with significant increases in CH, CRF and CCT, in addition to the expected elevation of IOP and that reinitiation of the medication reversed these effects. Until now, initiation of PGA treatment in previously naïve eyes has been associated with CH increase in glaucomatous eyes,8 ,9 which is opposite our findings in patients under chronic treatment. The strengths of this study include its prospective design, with reinitiation of PGAs 6 weeks after the initial cessation, the absence of dropouts and the use of contralateral eyes as controls. Topical PGAs are thought to lower IOP through increasing uveoscleral outflow, while having minimal impact on the traditional trabecular outflow.18 Homeostasis of ciliary muscle and sclera extracellular matrix (ECM), which contain collagen types I, III, IV, laminin and fibronectin, requires a fine balance between matrix metalloproteinases (MMP), that degrade specific proteins and the tissue inhibitors of matrix metalloproteinases (TIMP).18 Previous studies involving animal and human scleral tissues exposed to prostaglandins or PGAs demonstrated significant MMP upregulation and TIMP downregulation with the corresponding altered gene expression,19 ,20 suggesting that PGAs stimulate ECM degradation of ocular surface tissue by modulating the balance between these enzymes. Lopilly Park et al21 confirmed similar changes in vivo from human tear proteomics and conjunctival impression cytology. These authors also showed decreased collagen type I level and corneal thickness in PGAs-treated rabbit eyes, paralleling studies confirming corneal thinning in patients treated with PGAs.22 All this evidence corroborates our findings of significantly increased CCT upon cessation of chronic use of PGAs and its subsequent reduction following re-initiation of the medication. Along the same line, as CH and CRF reflect the corneal rigidity and ability of resisting strain, any structural weakening of the cornea is expected to result in reductions in these two parameters, as were suggested by our results. Some authors found increased CH values following PGAs use.8–10 These studies, however, were done in previously PGAs-naïve patients, contrary to our patients who were on PGA monotherapy for at least 1 year. The increase in CH invariably occurred within the first 6–12 months following therapy initiation, paralleling IOP lowering.8–10 As IOP reduction by other topical hypotensive medications23 and by various surgical interventions7 results in CH recovery, we hypothesise that the observed increase in CH in these studies may be largely due to IOP lowering, whereas the true effects of PGAs over corneal tissues remained camouflaged. In keeping with previous studies, our results confirmed the association between CH4 ,6 and glaucoma damage, even though the study was not designed for this purpose. CRF also showed correlation to glaucoma damage. We observed significant positive correlations between CH and CRF and MD on baseline Humphrey VF and RNFL thickness on OCT, in patients with moderate glaucoma. Considering the association between CH and POAG and the dynamic nature of the former, it is possible that CH evolves as glaucoma progresses and that the association between the two becomes clinically more apparent in the later stages of the disease. In fact, a recent retrospective study has found a significantly greater rate of decline in CH over time in patients with POAG when compared with healthy controls,24 supporting our hypothesis. In our study, the cessation of PGAs reduced IOP underestimation by Goldmann tonometry. This was not surprising given the established association between low CH and IOP underestimation and knowing that CH was lower in eyes treated with PGAs.17 This finding raises the concern over the accuracy of IOP measurement in patients under chronic PGAs therapy. In addition, recent studies suggested that lower baseline CH tends to result in greater IOP reduction following topical hypotensive therapy.8 This calls for additional caution when assessing the effectiveness of IOP lowering, especially in patients with more advanced glaucoma, which in itself tends to be associated with lower CH. In summary, we showed that patients on long term PGAs monotherapy had CH, CRF and CCT values significantly inferior to those obtained when PGAs were discontinued. We also showed that Goldmann IOP was significantly underestimated while taking PGAs. We confirmed that IOP underestimation was more important in eyes with lower CH values and that CH and CCT were positively correlated in these eyes. Finally, among patients with glaucoma of moderate severity, lower CH and CRF values were associated with more severe damage, as measured by Humphrey VF MD and RNFL thickness on OCT. These results warrant caution when clinicians assess accuracy and adequacy of IOP control in patients under chronic PGAs therapy, especially in those with more advanced disease and lower CH. The authors would like to thank Karolyn Forget, Ellen Freeman, Charles-Édouard Giguère and Leila Mejdoub for their knowledge and technical support.
. Corneal biomechanical changes following trabeculectomy, phaco-trabeculectomy, ahmed glaucoma valve implantation and phacoemulsification. J Ophthalmic Vis Res 2014;9:7–13. Canadian Ophthalmological Society Glaucoma Clinical Practice Guideline Expert Committee; Canadian Ophthalmological Society. Canadian Ophthalmological Society evidence-based clinical practice guidelines for the management of glaucoma in the adult eye. Can J Ophthalmol 2009;44(Suppl 1):S7–93. HF DDUJE. Cornea and sclera. In: Levin LA, Nilsson SFE, Ver Hoeve J, et al., eds. Adler's physiology of the eye. 11 edn. Elsevier, 2011:71–130. *RM and QW were equally involved. **PH and IB were equally involved. Meeting presentation: Preliminary results presented in part at the Association for Research in Vision and Ophthalmology (ARVO) on 7 May 2014. Contributors This study was designed by PH and IB. Data were collected by RM and analysed by RM, QW and IB. The manuscript was drafted by RM, QW and DP and critically revised by IB and PH. Funding This work was supported by The FRQS Research in Vision Network, Montreal, QC, Canada. Funding organisation had no role in the design or conduct of this research. Competing interests PH reports other grants from Allergan and Alcon. Ethics approval Maisonneuve-Rosemont Hospital Institutional Review Board.